Entertainment Studies students are drawn from all over the world, and from all social, educational and ethnic backgrounds. This truly international and dynamic mix of people come together to learn various aspects of Film and Television production and the Music Industry, encouraging a truly global and international approach to intellectual discovery, academic life and practical skills application which cannot be matched elsewhere. Located in the epicenter of the entertainment industry, the Entertainment Studies programs are taught by working industry professionals and provide a true “Hollywood perspective” designed to meet industry standards with the integrity and quality of a curriculum approved by the UCLA Academic Senate. Many courses feature guest speakers who are high-powered executives in the entertainment industry. Plan ahead by contacting a member of our customer service team for guidance about individual classes and programs. Requests for a Transcript Assessment (review of current standing in a program) by the student advisor should be made 8-4 weeks prior to enrollment in your next quarter. Call (310) 825-9064 for advisement over the phone, or to make an appointment. Or you may email your request. Customer service is available to assist you Monday-Friday, 9am-6pm. To succeed in the entertainment industry we know it’s also important to meet new people and explore your interests through a variety of outlets. The Entertainment Studies program offers quarterly networking events for certificate students to connect with one another. For more information and to enroll in our free networking “class,” click here. Course credit for sponsored internships is available to Entertainment Studies Certificate Students who have completed a portion of their certificate program requirements. The internship course can be taken for credit an unlimited number of times – however, students may only apply a maximum of 8 units toward elective requirements for their certificate program. For more information, visit the internship page. Entertainment Studies programs are approved for a variety of grants and loans. Visit the UCLA Extension Financial Aid Office website for more information. UCLA Extension Career Resources has partnered with InsideTrack Career Coaching, which offers three online career coaching packages starting at $29.95. Students may also subscribe to Handshake, the UCLA Career Center online job board where employers across industries post job and internship opportunities at all career levels. Handshake access is FREE for current enrolled certificate students (with paid candidacy). To register, please visit the following link for details: https://careers.uclaextension.edu/resources/handshake-online-job-board/. Note that the Writing Center can help with proofreading, but will not proofread your writing for you. UCLA Extension certificate candidates can obtain a BruinCard affiliate identification for a $10 fee. The card is valid for the duration of your program. For convenience, you can deposit money on account with UCLA, then use that money via your card as a fee-free debit card at the ASUCLA bookstore, campus food facilities, and various enterprises in Westwood Village. To simplify your commute, cardholders may purchase discounted TAP cards valid on LA Metro buses, and Flash Passes valid on the Santa Monica Blue Bus and Culver City lines. For more information about BruinCard, visit the UCLA Extension BruinCard FAQ page. The BruinCard is an optional photo ID. Our certificate candidates are not required to have a BruinCard to enroll in Extension classes, and all Extension students with a receipt showing current enrollment are eligible for educational discounts at the ASUCLA computer store and services provided by the UCLA Libraries. Your Bruincard and/or proof of enrollment can be used to verify enrollment and receive standard student discounts at the UCLA Store, including the computer store. For current merchandise and promotions, visit the UCLA Store website. To qualify for the discount you must be enrolled in at least one UCLA Extension course for the quarter in which you plan to make the purchase. Some restrictions apply for personal computer purchases at the UCLA Computer Store. When purchasing merchandise, make sure that you present your current UCLA Extension receipt as well as your Driver’s License or UCLA Student Bruincard ID. 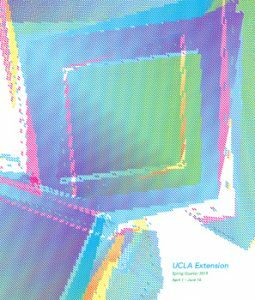 All UCLA Extension students who want access to UCLA libraries must purchase a library card at the circulation desks of the Biomedical Library or Charles E. Young Research Library. The fee is $28 per quarter with proof of Extension enrollment. Visit the UCLA Library website for more information. For information on available UCLA housing, visit the UCLA Campus Housing website. Your certificate candidacy allows you to enjoy student affiliate recreation privileges on the UCLA Campus for a nominal, optional fee of $50/quarter. Enjoy racquetball or a workout before class, or unwind with weekend windsurfing at UCLA’s Marina Aquatic Center. To pay fees, present your current BruinCard along with a printed verification of current enrollment from Extension’s MyExtension website at the Recreation Sales and Service office at the John Wooden Center. For more information, contact UCLA Recreation directly at (310) 825-3701 or email info@recreation.ucla.edu. The Center for the Performing Arts brings a wide variety of internationally recognized artists to Los Angeles each year. Learn more at the center’s website. Click the catalog image above to view all courses offered in the Entertainment Studies program! To view a digital version of the course catalog, click here. Course titles are hyperlinked.